Soudal has launched an Australian first – a revolutionary, professional quality express drying, low shrinkage gap filler that may be painted immediately. Often, when a gap filler is painted too early, cracks appear in the paint film, which can be escalated with matt or flat ceiling paints. The issue occurs when traditional gap fillers shrink as they dry, causing the paint to crack. Wet On Wet is ideal as a gap filler when immediate painting is required with no waiting time. Due to its unique composition, it minimises the risk for mud cracking or paint crazing, even with difficult highly-filled and covering paints. It is immediately paintable with gloss, semi-gloss and low sheen paint and flat and ceiling paints can be painted after just 10 minutes. Wet On Wet can be used for filling and sealing in walls, ceilings, around window frames, skirting boards, tiles (except showers), staircases, architraves, coving, plasterboard, trims, floorboards, etc. 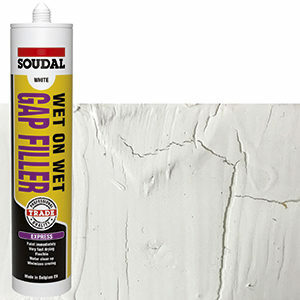 Soudal Wet on Wet may be used both internally and externally, is flexible, colourfast and waterproof after curing, and suitable for most common building materials.